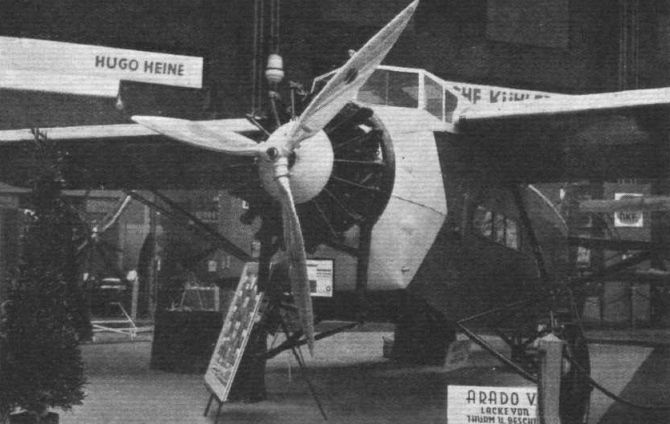 The Arado Company, of Warnemunde, exhibits two machines, of which one is the two-seater shown at the last Paris Show, and which is a school and practice type. The other is quite a new type of small ДальшеMore>>> passenger 'plane, which, so far as we are aware, makes its first appearance at the Berlin Show, and has not yet been put into general service. This machine is known as the type V. I (the letter V presumably standing for Verkehrsflugzeug). It is a high-wing monoplane of the semi-cantilever type, the bracing struts being intended mainly to stiffen the wing against torsional stresses. The cabin has four seats, all passengers facing forward. Aft of the cabin is a luggage compartment, while in the forward wall is a door communicating with the cockpit. The latter has two seats, side by side, so that if necessary two pilots can be carried, or the extra seat may be occupied by a passenger. The fuselage is of welded steel tube construction, fabric covered over the rear portion. The fuselage decking is detachable so as to facilitate inspection of the fuselage bracing, &c. In front the engine, a B.M.W. Pratt & Whitney "Hornet," is separated from the pilot's cockpit by a fireproof bulkhead. The petrol tanks are mounted one on each side, inside the wing, giving direct gravity feed to the carburettor. Their capacity is 585 litres (129 gallons). The monoplane wing is, as distinct from a number of German monoplanes, built in two sections to facilitate storage and transport, and is of wood construction with three-ply covering. 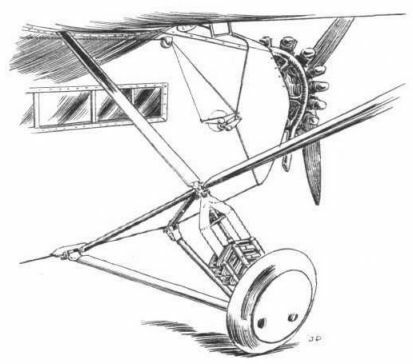 The undercarriage is of wide track, and the member carrying the shock-absorbing medium is not taken to the wing as in so many machines, but to the fuselage via the junction of the wing struts to a pair of short struts running to the lower longerons. One of our sketches illustrates the arrangement. The Arado V. I has an overall length of 12 m. (39-4 ft.), a wing span of 18 m. (59-1 ft.), and a wing area of 47-24 sq. m. (508 sq. ft.). The tare weight is 1,350 kg. (2,970 lbs.) and the permissible load 1,000 kg. (2,200 lbs.) giving a total loaded weight of 2,3,50 kg. (5,170 lbs.). The wing loading is thus 50 kg./sq. m. (10-2 lb./sq. ft.) and the power loading (on 500 b.h.p.) 4-7 kg./h.p. (10-33 lb./h.p.). No detailed performance figures are available, but the maximum speed is stated to be in the neighbourhood of 200 km./h. (124 m.p.h.). The Arado V. is passenger monoplane fitted with Pratt & Whitney "Hornet" engine. The Arado Commercial Monoplane has a fairly elaborate arrangement of wing and undercarriage strutting, as shown in this sketch. The shock absorbing element is in the form of rubber rings, arranged as in the Fokker machines.